A naturally derived gel toothpaste to keep your pearlers squeaky clean. 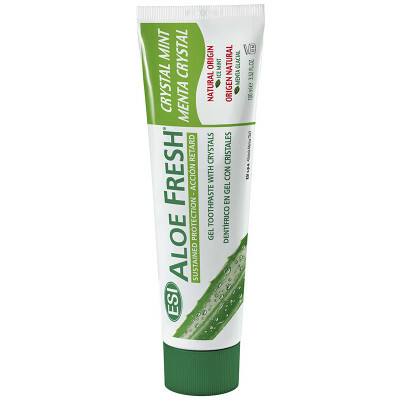 With an extended release action though this Aloe Fresh Toothpaste will also strengthen gums and combat bad breath. Aloe Barbadensis leaf juice, Mentha Viridis extract, Chamomilla Recutita Flower extract, Echinacea Angustifolia leaf extract, Aesculus Hippocastanum extract, Sodium Myristoyl Sarcosinate*, Sodium Methyl Cocoyl Taurate, Menthol, Ammonium Glycyrrhizate, Aroma, Carboxymethyl Chitosan, Sodium Benzoate, Potassium Sorbate, Sorbitol, Aqua, Hydrated Silica, Silica, Citric Acid, Glycerin, Potassium Sorbate, Xylitol, Chlorophyll Ci 74160 (natural origin), Xanthan gum. One of the top natural toothpaste out there and well priced too. This toothpaste has a lovely texture and taste. One of the top natural toothpaste out there and well priced too. Unlike most SLS free products, this toothpaste foams magnificently! The foamiest I've ever had since moving to natural toothpastes. Tastes great and NO bad chemicals! I'm in love with this toothpaste! Initially I was skeptical about the Aloe since it can be bitter, but I can't taste it at all. It's minty and leave my mouth feeling fresh, just like regular toothpaste but without all the dangerous chemicals. It doesn't foam much, but there is still some foam although, even if it didn't foam at all, I'd still recommend it. Price wise it is a little more expensive than the toothpaste I normally buy. But only around R20 more for the same amount. And 20 bucks is nothing in the greater scheme of avoiding the junk chemicals they put in regular toothpaste. This is a definite winner in my home. Very nice taste and lasts quite long. It feels like it also cleans better than commercial toothpaste! So far so good, doesn't foam up as much as commercial retail toothpastes but enough so to give you a fresh cleaning feel. I feel like it's keeping my teeth whiter than conventional toothpaste but cannot be sure, only a week or two into using, but really liking how it does not burn my mouth ensuring I can brush for longer. I like this toothpaste. Leaves my mouth feeling minty, it foams well and it's healthier for the environment, what's not to like. Foams like most commercial toothpastes. Mildly minty and not as eye-wateringly overpowering as others. Affordable, considering the 100ml compared to other popular and similarly priced brand in 75ml. Such a nice minty taste and leaves your mouth feeling nice and fresh. We love it! The best toothpaste so far. Fresh. Minty. Gel. Foam well.